When I was little, roller skating was the focal point of fun. The skating rink was always rowdy with rollers and that’s where most parties took place. The process of growing up meant that we had to pick a particular pat of our personalities that we wanted to pursue – skates gave way to scooters and helmets gave way to hair straighteners. Since there wasn’t any extra curricular activity with a skating aspect at school (unless you had a hockey team), the talent to skate backward or the time it took you to skate a lap or the ease with which you managed to maneuver on skates gave way to how ambidextrous you were with a basketball, what styles you could swim, whether you were a Mathlete or an athlete, whether you were a pageant girl or a spelling whiz. Thankfully roller derby didn’t disappear, though, and the option to skate is still open. A couple years ago my girlfriends and I rented the movie Whip It and we were fast fans. We decided to see what the derby looked like live, and it didn’t let us down. 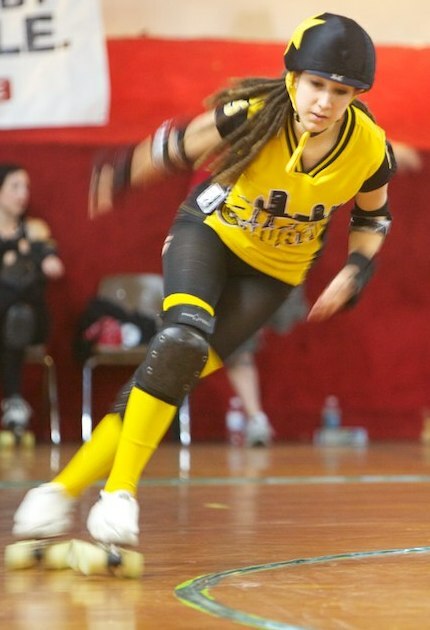 Hurricane Heather (Category 5) of The Steel City Derby Demons in Pittsburgh soon surpassed Steve Nash on my list of favorite athletes. She’s basically the ninja of skating – now you see her, now you don’t and fifteen points later you finally realize where she went. The atmosphere at their bouts is amazing – derby spans the spectrum from child to grandparents, gay and straight, old fans and new faces – it is always packed to perfection. From there I met other derby darlings who were starting their own team. The Morgantown Roller Vixens of Morgantown, WV included me in their fundraising efforts, let me sit in and see them practice, and kept me up to date with what they were doing – the frustration of finding a practice facility, the costs of competing, the insurance issue. I then heard about a happening closer to the area that I was at: The Ohio Valley Roller Girls were having their first match foray. I not only got to see the experience and eloquence of a Steel Hurtin’ team that is top notch, but also the beginning blossoms of starting such a sensational sport, and finally a teams first competition. With such talented teams already in existence and new ones popping up all over the place, roller derby is demanding that being a jammer is just as much an option as being a volleyball setter, that girls can have other goals besides soccer ones. Derby is a display of strategy and strength, talent and teamwork, harmony and hard hitting. It is a combination of capability and craftiness, especially when it comes to a personal persona – Bohemian Blasphemy, Twizted Tiffsta, Joy D’Vicious, Mama Mischief, Bone-Crusher, Wham Bam Pam and Debbie Scary creatively compete. Roller girls pay their dues. Literally. It takes a lot of out of pocket price to be a part of the pack, so support your local team, and hey – don’t be scared to put those skates back on. In fact, derby dares you to! A friend of mine is into derby here in CT (her name is DoomCake). Since, I’ve attended a few bouts and it’s always a great time. Their link is http://www.ctrollerderby.com/ for anyone who may be interested! I love derby! We have I think 4 teams just locally, and then 2 in surrounding cities that are nearby, so it’s a big deal here! Thanks for the share!